Today QCR Recycling Equipment launched its new website offering a complete range of solutions from industry leading balers to the newly launched PyroPure. The launch of the new website, which offers quick and easy access for our users to navigate and find the solution they are looking for, is part of QCR’s ongoing efforts to enhance the quality of its communications. The website is a modern, colourful design and is divided into three sections: Solutions by materials, Solutions by sector and Solutions by baler size. QCR has solutions to cater for the smallest of convenience stores to the largest distribution centres offering a solution which is right for them. Website users can access as much detail as they wish right down to the machine specifications, however users are encouraged to contact us so we can understand their requirements in detail and recommend the ideal solution for them. 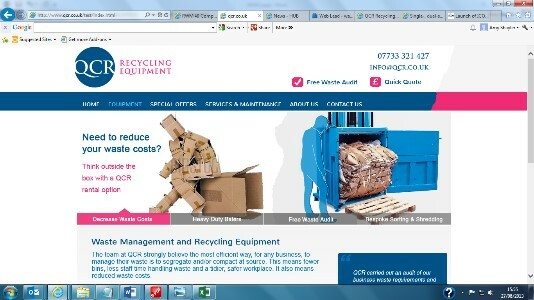 For more information on QCR’s recycling equipment solutions, please contact us on 01242 620 903 or email info@qcr.co.uk.